As part of our food column, our journalists review two more eating options near RI for your digestion – Shunfu Mart and Brownice. Situated a short two bus-stops away from school, Shunfu Mart is a hawker centre located at Blk 320, Shunfu Road. Even before embarking on this food trail, one will often hear rave reviews of this food centre, well known for its popular baked goods stall, Chocolat N’ Spice. However, when we arrived at around 7pm, many stalls in the complex, including the baked goods stall, were already closed, so for prospective patrons out there, be sure to arrive early so as to enjoy some of their mouthwatering muffins! We first sampled the char siew and roast pork rice ($3). The meat from this stall was well-prepared and the gravy in particular was the highlight of the dish. This stall offers generous helpings and comforting local food, but due to the dry texture of the rice, you might want to consider a refreshing bowl of soup ($2.50, various flavours including watercress and lotus root) as an excellent complement to the meal. Another recommendation would be the duck rice ($3). The braised rice that accompanied the duck rice was slightly oily but aromatic and flavourful. The duck meat is tender and delicious accompanied with the stall’s chilli sauce, and has equal shares of fat and lean meat. The meal comes with piping hot soup and the friendly aunty here will also remind you to scoop your bowl of duck & peanut soup on your way out! Other than duck rice, this stall also offers kway chap and mixed rice dishes, which we were unfortunately unable to try. Taking a quick glance around the market, there are other stalls that sell char kway teow and mixed rice, and top off your meal with a cup of homemade barley or grass jelly at the drinks stall ($0.50-$0.70). Do note, however, that if you do not wish to order the mixed rice dishes, the food centre is rather lacking in vegetarian options. Overall, Shunfu Mart didn’t live up to its hype (perhaps owing to the fact that we were unable to review a number of stores), but we all enjoyed substantial meals at wallet-friendly prices. After dinner, we decided to treat ourselves to dessert and headed to Brownice, a short walk away at Sin Ming Centre, 8 Sin Ming Road #01-03. Instead of the indulgent, full cream ice cream most of us were accustomed to, Brownice’s speciality was selling unique brown rice ice cream. It is even in the Singapore Book of Records as the first vegan ice cream store! The shop is air-conditioned and has plenty of seats as well as power sockets, perfect for sitting down with dessert and having small study groups or discussions. It also has an inviting and warm atmosphere, spacious and decorated in white and pale blue. The staff were friendly and we were allowed to sample as many flavours as we liked before purchase. We were greeted by a variety of dessert choices to go with our brown rice ice cream, including waffles, brownies, hot pockets, teas, and coffees. Brownice’s specialities include the mudpie (a hazelnut chocolate and french chocolate ice cream confection, $9.80) and of course, various other flavours of these healthy brown rice ice cream. There were many options available, including an array of chocolate flavours for the chocoholics among us. We ordered a three-scoop cup ($7) which was the greatest value-for-money, and also perfect for sharing. The three flavours we chose were Banana Oat, Strawberry, and French Chocolate. One thing that immediately struck us was the rich flavours of the ice cream despite the lack of artificial flavouring! The taste of fresh fruit and quality chocolate was unmistakable. 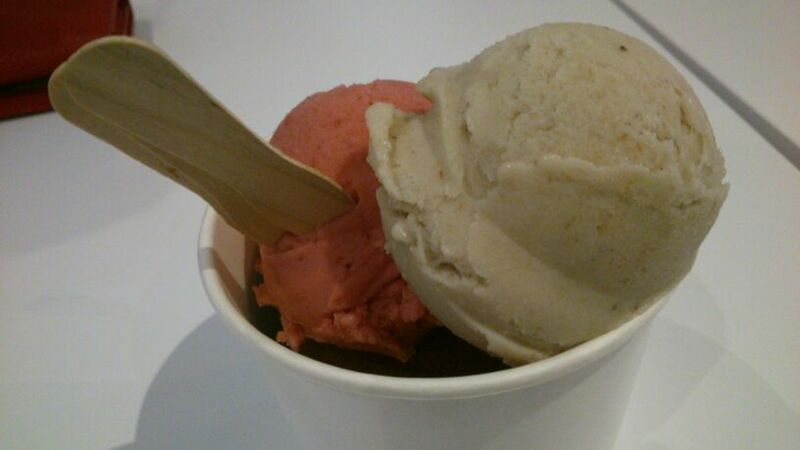 Out of the three we sampled, the Banana Oat ice cream stood out due to its unique, dulcet flavour. The French Chocolate was soothingly sweet without being overly saccharine, as was the Strawberry flavour, which had a refreshingly zesty, sorbet like taste. Tired of jostling with the crowd for the queue at Udders or Salted Caramel? Well, we highly recommend Brownice for everyone looking for a guilt (and calorie)-free treat, with their unique brown rice ice cream offering a fun alternative for even the lactose intolerant. Thanks for the review on Brownice. I’m glad there is another vegan option out there. The banana oat sounds particularly tempting. Do you know if there are other branches? 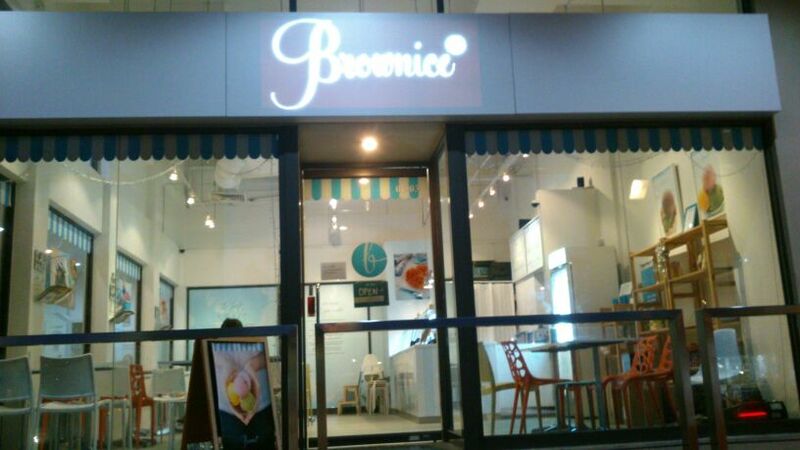 there is another outlet at Zhongshan Mall (Balestier), but you can also find Brownice ice cream at Real Food restaurant — Novena; Central; and Killiney.